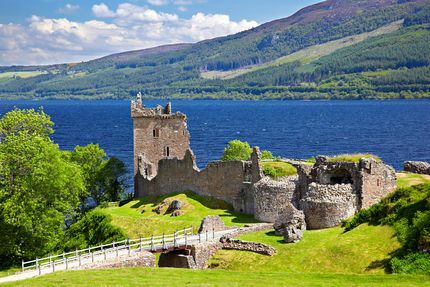 Urquhart Castle Loch Ness was built as a Nobleman's residence with extravagance in mind, rather than defence. Over the years it has been rebuilt and repaired following many attacks from hostilities and the weather. It has the nickname The Guardian of the Glen. Around 580AD St Colomba came on a peaceful visit to Urquhart Glen and surrounding area to bring the message of Christianity. As he was travelling up the Loch, he was called to the shore where the Nobleman Emchath was dying. He baptised Emchath who then passed away peacefully. St Colomba also baptised the other family members. It is here that St Colomba repelled an attack from a water beast (though to have been Nessie the Loch Ness Monster) by raising his holy hand at the beast and commanding it to leave. The land was granted to the Durward family by King Alexander the Second for the aid given from Sir Thomas le Durward during the 1228 men of Moray uprising. Sir Thomas died soon after and the land passed onto his son-in-law, Alan, who is thought to have built the first castle. He rarely stayed there because he held estates throughout Angus and Eastern Scotland. Instead, one of his trusted knights would reside. It would see usage as estate office, barracks, prison and law courts, as well as accommodation. Alan Durward died with no male heir in 1275 so the King took control of the castle and granted it to John Comyn, Lord of Badenoch and Lochaber. In 1296, Edward the 1st of England attacked and seized the castle. His nickname was Hammer of the Scots. Sir Andrew de Moray launched an unsuccessful attack to regain Scottish power in 1297. He later seized back Stirling Castle from Edward the 1st, which ultimately led to him regaining Urquhart Castle when the English garrison surrendered. Scottish reign was short lived when in 1303 Edward returned and retook it. 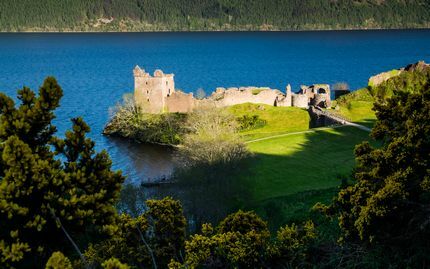 It lay in English hands until 1308 when Robert the Bruce was crowned King of Scotland and overthrew many English occupied castles, Urquhart Castle included. The only King of Scotland to have stayed there was David the Second in 1342. His residence was during the summer months and it is thought he came for the hunting. During the 14th Century, the MacDonald Lords of the Isles attacked the local area and ruled from the castle. The following two centuries saw many Scottish clan raids with ownership transferred between the winning clans. It was last used for the garrison of Scot's soldiers in 1689. The Gatehouse was blown up in the year to prevent its use by invading armies. Following the storms of the late 17th Century it fell into disrepair and much of the original stonework was taken by locals for their own use. The Grant Tower still exists on the far left of the site from where some bonnie views of Loch Ness and the surrounding Great Glen can be seen. It wasn't until 1911 when the late Caroline, Countess of Dowager of Seafield, the widow of the seventh Earl of Grant entrusted it to state care. Historic Scotland has modernised areas to allow access to visitors, combining modern and ancient architecture to give a feel for how it would have looked in it's day. Parking is free and there is disabled access around the grounds, shop, cafe, video presentation and relics. Walking down from the entrance booth (there's a lift for disabled access) takes you through the indoor exhibits of relics and historical artefacts found from the site over the years. There is a model of how Urquhart Castle, Inverness, would have looked at its peak. This then leads to the cinema room where a presentation of the castle history can be viewed. Follow the gently sloping path to gain access towards the castle stopping off at the replica trebuchet, which would have been used in the 14th Century to hurl huge stones during attacks. A few yards ahead you can view the rock cut ditch defence. This measures approximately 30 metres and 5 metres deep at the extremes. Entrance is through the Drawbridge - now accessed by a modern wooden bridge. The remains of the Causeway can still be seen before entering the two storey Gatehouse that would have provided accommodation to The Castle Porter at the ground floor and for the Constable on the upper floor. Both would control entry and exit. Their fireplaces, bed recesses and latrines can still be seen. They also guarded any prisoners and the rear of the gatehouse housed the Prison - you can still view this and observe an inhabitant! The Portcullis grooves are still evident in the Entrance Passage, which is wide enough to allow entry to carts. Just further on there would have been a secondary defence of strong wooden doors. To the left was a second Gatehouse that was later converted to a Kiln-House for storing, drying and grounding corn for use as meal and flour. Walking into the heart of the castle through the Inner Close you pass the remains of the Stable Block with the Kitchen remains to the right and the Kiln next. Next to the Kitchen is the Dovecot - a source of pigeon meat and eggs. This was important to feed the Lord and the castle staff during the bleak winter months. The area next is thought to have been the Smithies. A gentle walk up to the Summit gives you views over what would have been the castle town. Heading back down towards the Kitchen leads to the Chapel on the left. This is thought to originate from 580AD when St Columbia baptised the Pictish nobleman Lord and his family who lived in this spot. Passing here brings you to the Grant Tower, which would have provided sleeping accommodation on two levels for the Lord and Lady and her Lady in waiting in the Chamber above. The ground floor would have been the entertaining and banqueting hall and it is thought that the cellars were used as an additional kitchen and storeroom. All five levels can be accessed by a combination of modern and original stone steps culminating in access to the remains of the tower. It's worth taking the effort of the climb to see the magnificent views across Loch Ness and the Great Glen of Inverness. The Grant Tower was built in 1509 by Sir John Grant. Cruises around Loch Ness take place on the Jacobite Queen boat. This offers rear views of Urquhart Castle. The boat has sonar equipment fitted underneath to try and capture an image of the Loch Ness Monster. These are beamed live to plasma TV screens on the deck so that visitors can see what secrets the murky depths hold.